Two storey villa with 4 Bedrooms located only 10 minutes from Central Seminyak. Such a perfect accommodation to ensure you have a great stay with your friend or family and easy access to the beach. 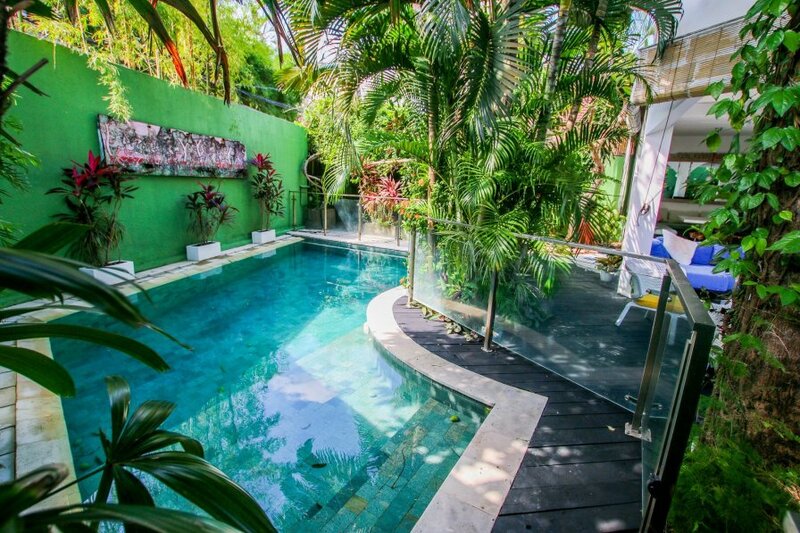 AMAZING and SPACIOUS 4 bedrooms, two-storied villa close to main street and beach, in the heart of Seminyak - the best location you can dream of! Jalan Dhyana Pura - one of THE MAIN STREET in Seminyak with all the best restaurants, bars, fancy night clubs, designer shops, beautiful beaches and surf spots but still super quiet! The villa looks very big and cozy. Please, check the photos - villa looks absolutely the same or maybe even better! Dining area with a big table and chairs for everyone. Large OPEN LIVING ROOM with sofas, big TV, fans and everything you need to relax. SPACIOUS BALCONY with nice view to swimming pool and garden. Beautiful private swimming pool with the stairs to sit on, surrounded by tropical garden. Sun bed to sunbathe and relax in front of the swimming pool. Swings with surrounded by tropical plants - perfect place to take a little rest before diving into the pool.